Iwaki's wafer boxes offer high levels of reliability. Iwaki manufactures injection molded trays called "wafer boxes"
Iwaki develops and manufactures products called wafer boxes, which involve no mold charges. Iwaki's wafer boxes (which can be used with 4 inch wafers) are standardized products that involve no mold charges. They can support special wafer thicknesses of up to 1.0mm. We also handle orders for wafer boxes with IC tags for process control, inventory control, or the like, and for the printing of company names, etc. We propose highly convenient products based on customers' product needs and desires. Let us hear what you want. Wafer boxes are involved in every semiconductor process. From the vantage of the entire semiconductor process, they could be considered the most important material. They are expected to be used in an even wider range of situations in the future. Iwaki's goal is to develop and manufacture products that will be chosen by as many customers as possible. This is why we believe it is important to listen carefully to our customers' wants and needs and do our utmost to turn them into reality. We began developing and manufacturing wafer boxes for just this reason. Iwaki's wafer boxes offer the following features. Support for special wafer thicknesses of up to 1.0mm. These features are what make it possible for our wafer boxes to meet our customers' wide range of needs. Our mission at Iwaki is to turn our customers' wishes into reality. Let us know anything and everything we can do for you. The wafer boxes developed and manufactured by Iwaki offer the following features. 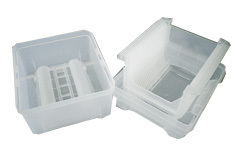 Iwaki’s wafer boxes protect customers’ wafers from external shocks and contamination. We hope you continue to use our wafer boxes. Wafer boxes are materials used in all semiconductor processes. By their nature, it would be fair to say that they are the most important materials used in semiconductor processes. Not only do they require no mold charges, they can also be embossed with company names and the like. Wafer boxes are required to provide the highest levels of reliability. We will continue to do our utmost to develop and manufacture even higher quality products with the same levels of reliability. Iwaki is a specialized developer and manufacturer of industrial trays and component trays. Our processes feature consistent planning, layout, design, and formation, enabling our products to meet our customers' wide range of needs. Let us know your wishes. We will do our utmost to turn them into reality.